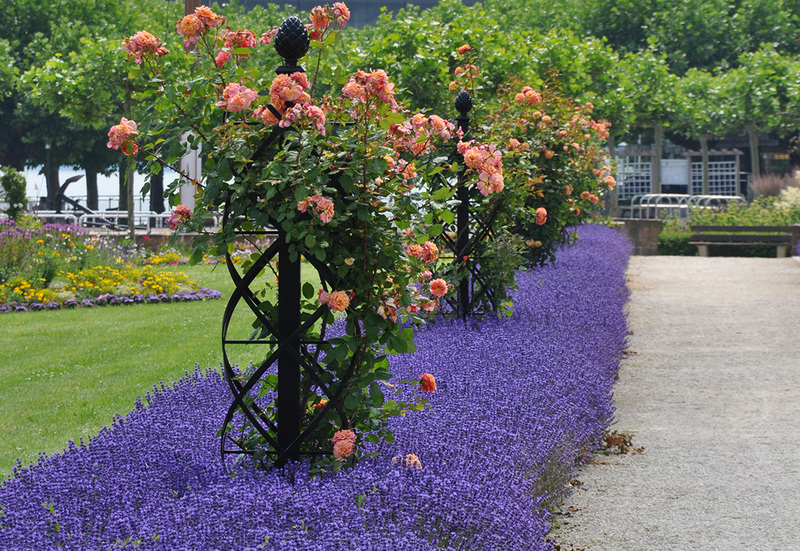 Luxuriant roses growing on arches donated by Classic Garden Elements at the Europa Rosarium Sangerhausen. 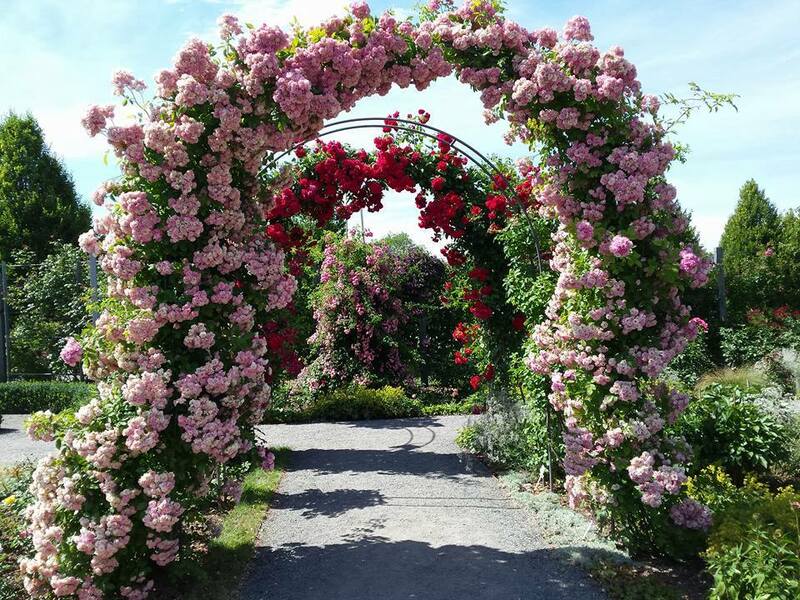 Every summer a delight for the eyes: Classic Garden Elements’ extra-slender rose arches at the Europa Rosarium Sangerhausen. 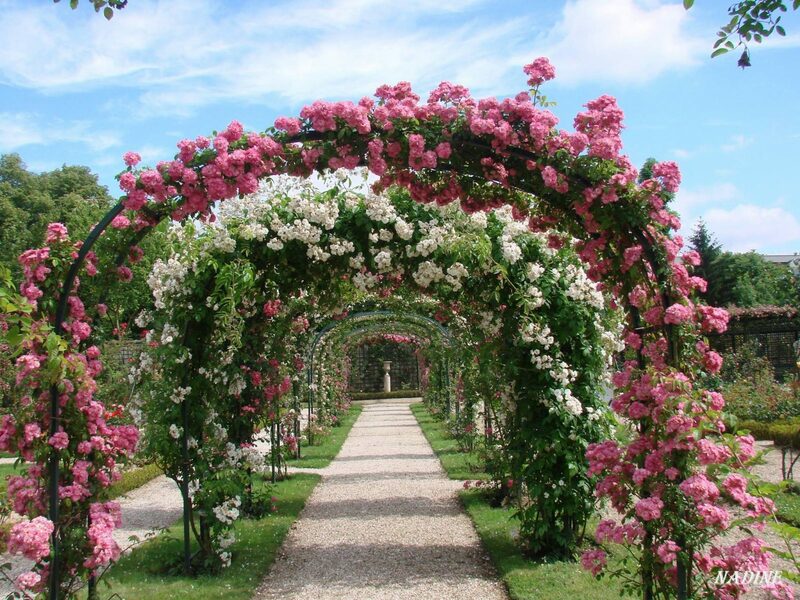 Covered by the flexible canes of rambler roses, the arch’s metal frames disappear completely behind a sea of blossoms for several weeks of the year. We are grateful to Dorothea Paulat for providing the photo. 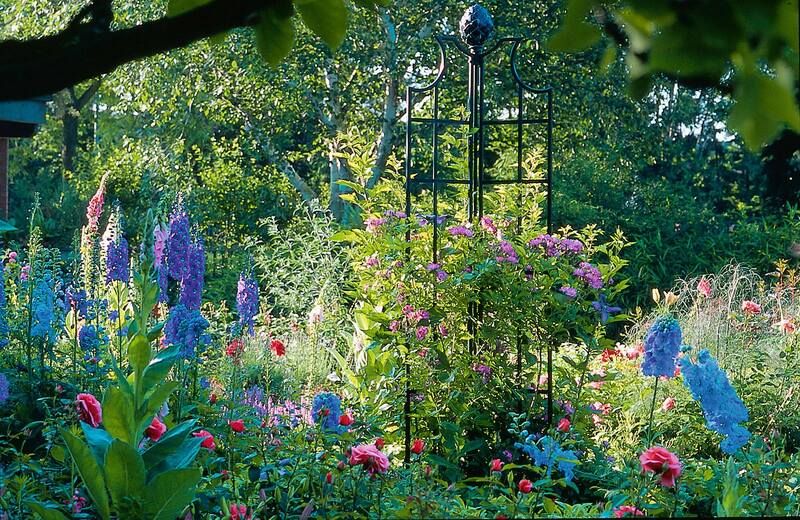 Amazingly deep blue delphiniums provide company for the Rose Obelisk II in a cottage garden in midsummer. 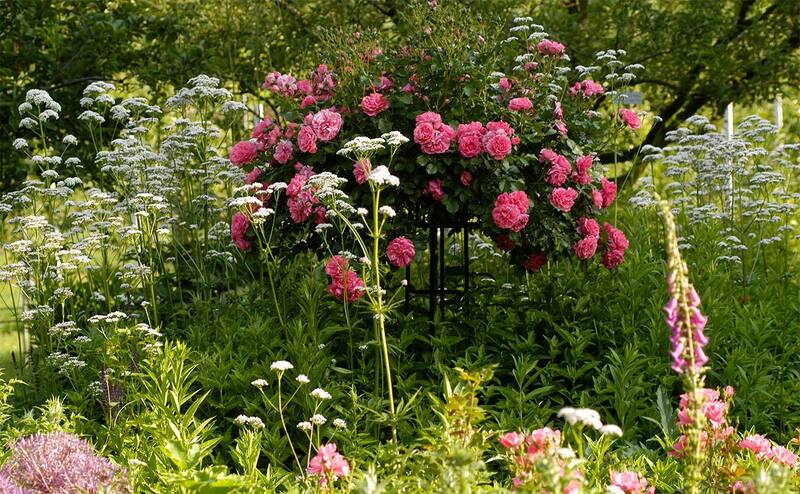 In the middle of a cottage garden, the ‘Velichenblau’ rose climbs up a Classic Garden Elements Rose Obelisk II. Clematis viticella ‘Polish Spirit’ looks on top of the world when trained on a Classic Garden Elements ‘de rigueur’ wall trellis. Here it radiates a wonderful clear cornflower blue. 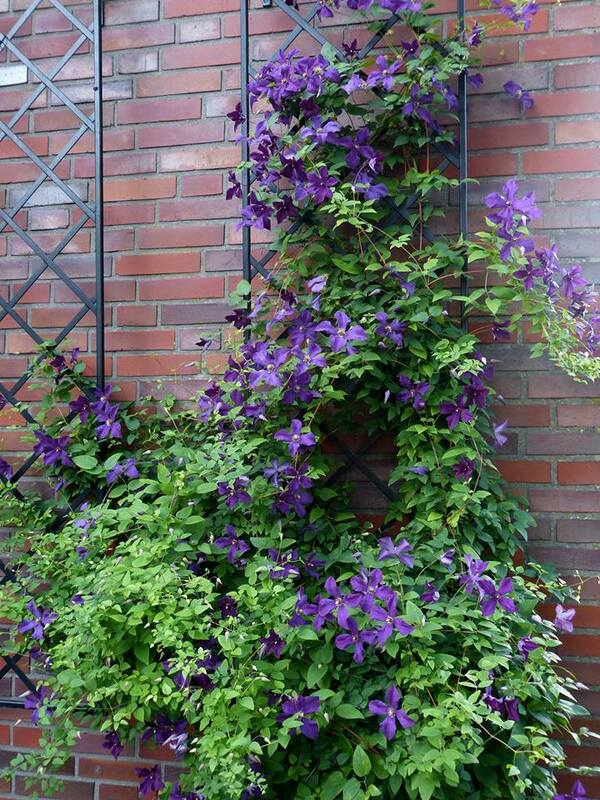 To grow upwards, ‘Polish Spirit’ clematis viticella needs stable support. 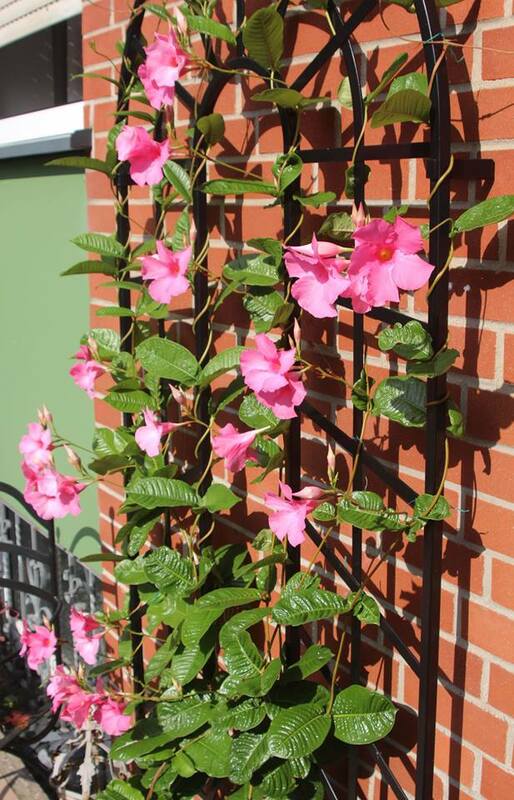 The Classic Garden Elements’ attractive diamond lattice metal frames are ideal for promoting these summer bloomers. 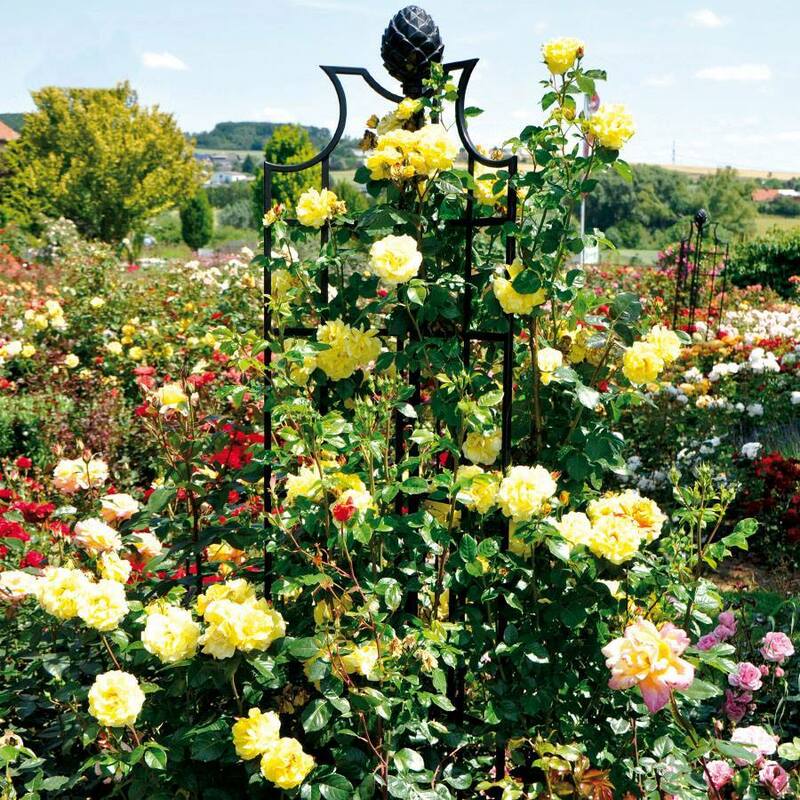 In this picture by Friedrich Strauss, a Classic Garden Elements’ ‘Jean Vibert’ extendable trellis provides reliable support for an array of heavy blooms. 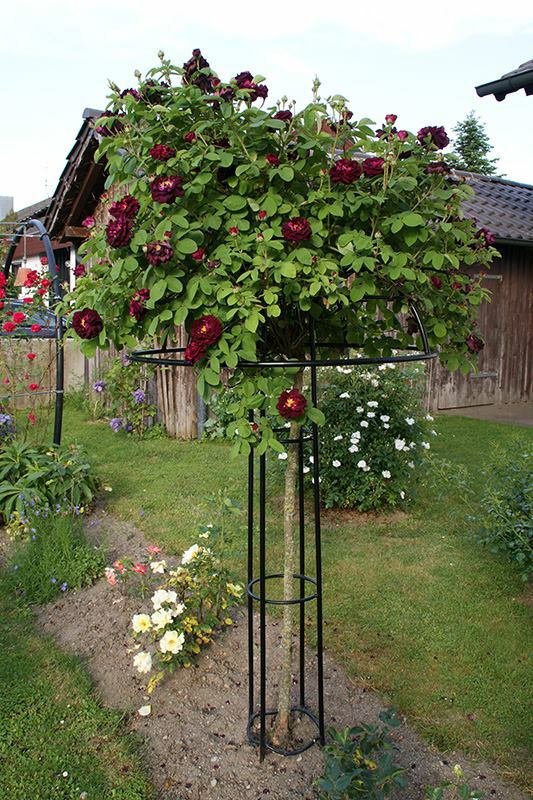 This sturdy and elegant metal support allows the enchanting ‘Super Excelsa’ climbing rose to grow even higher. 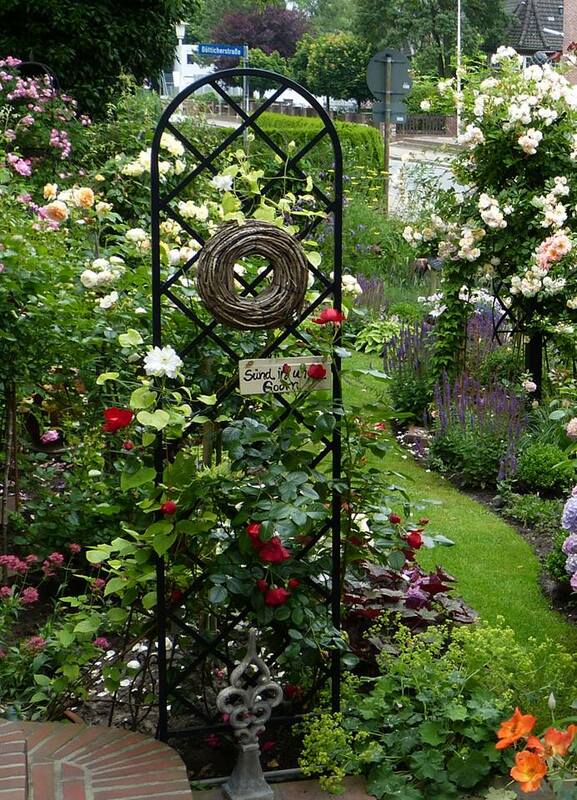 Stablility and unpretentious elegance are the hallmarks of the Classic Garden Elements’ free-standing “Beekman” trellis. Cleverly placed close to a house entrance, the Classic Garden Elements narrow “Beekman” trellis is the perfect eye-catcher. The metal trellis’s invisible anchor guarantees stability in every weather. 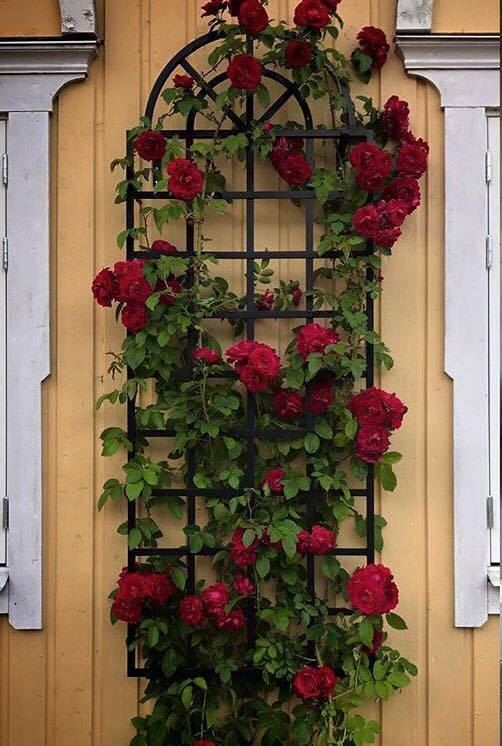 Even in Sweden, with its relatively cool temperatures, roses bloom in abundance on a Classic Garden Elements ‘Orangery’ Wall Trellis. 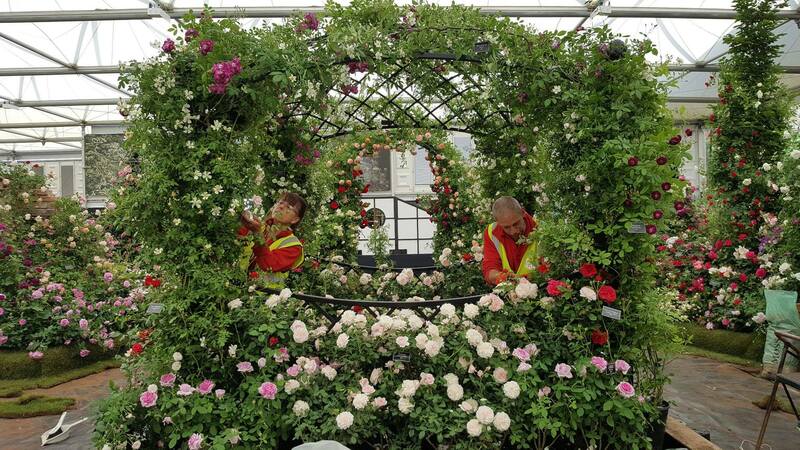 There is music in the air as an ‘Amadeus’ climbing rose scales a Classic Garden Elements Victorian Rose Arch. 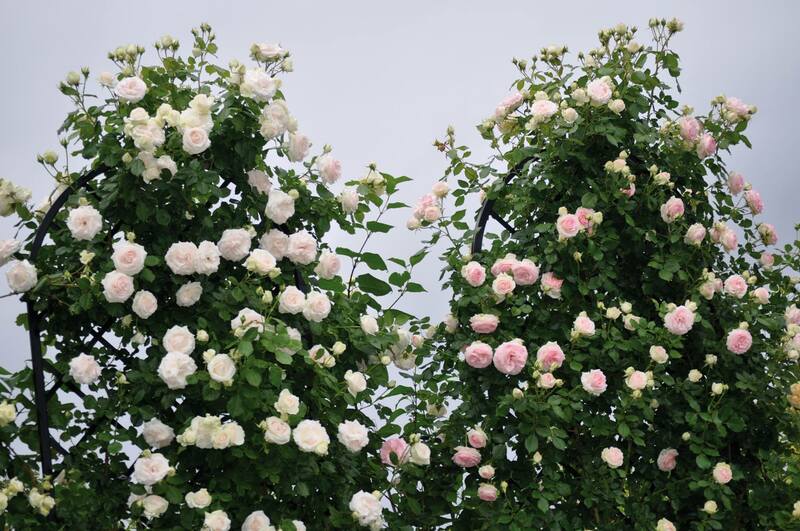 In olden times, when wishing still did some good … it was Sleeping Beauty herself, who realised that climbing roses have a preference for east- or west-facing facades. 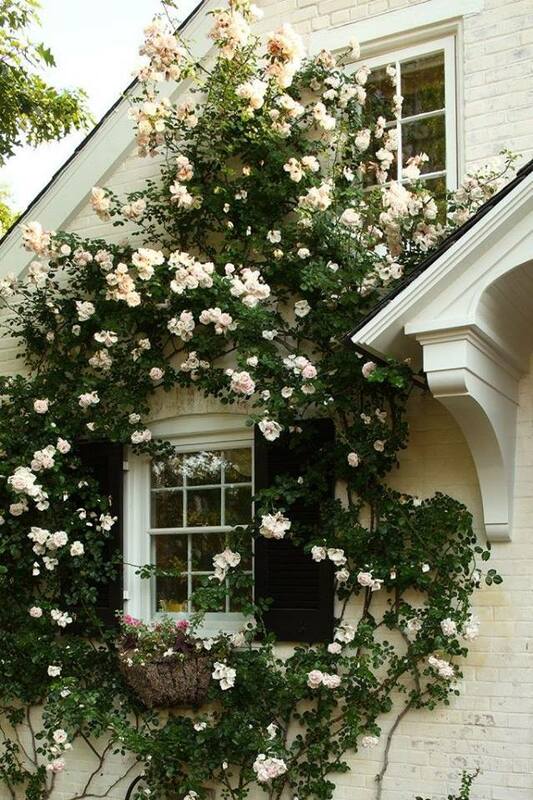 If your dream is a rose-covered castle to rival Sleeping Beauty’s, then plant your climbing roses on the east- or west-facing facade of your ‘castle’. And fair wishes may come true! 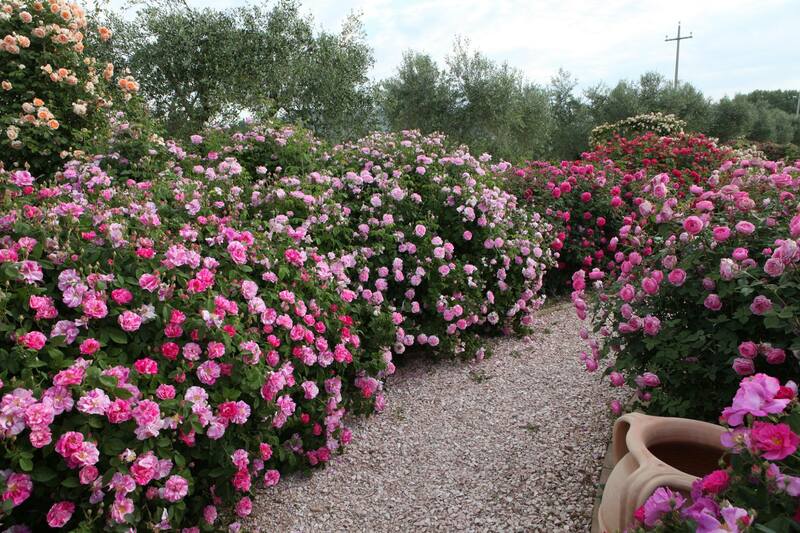 Old Roses ‘Rosa Mundi’, ‘Ispahan’, ‘Mme Isaac Pereire’, ‘Rosa gallica Officinalis’ and ‘La Reine Victoria’ in the magnificent ‘Quando Fioriranno le Rose’ rose garden in Assisi in Italy in a May photograph by Fabio Vetturini. 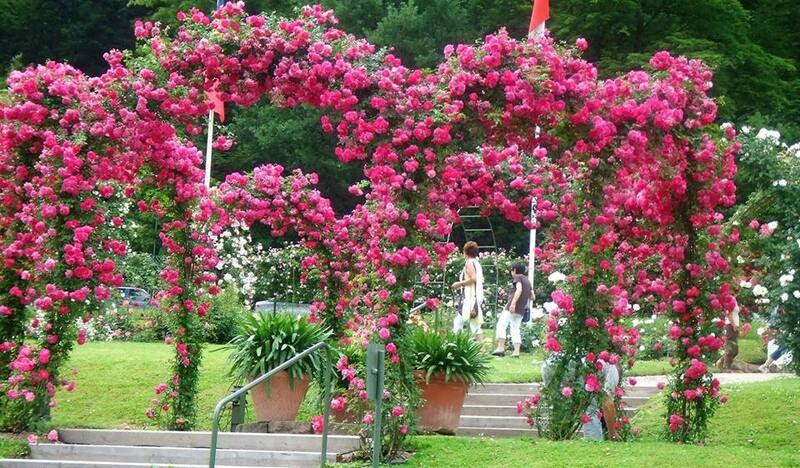 The once-flowering Rosa sempervirens-Hybrid ‘Adélaide d’Orléans’ (Jacques, 1826) growing on a trellis arch at the Rosarium Glücksburg. ‘Golden Gate’ roses by Kordes in full splendour on a Classic Garden Elements ‘Rose Obelisk II’. 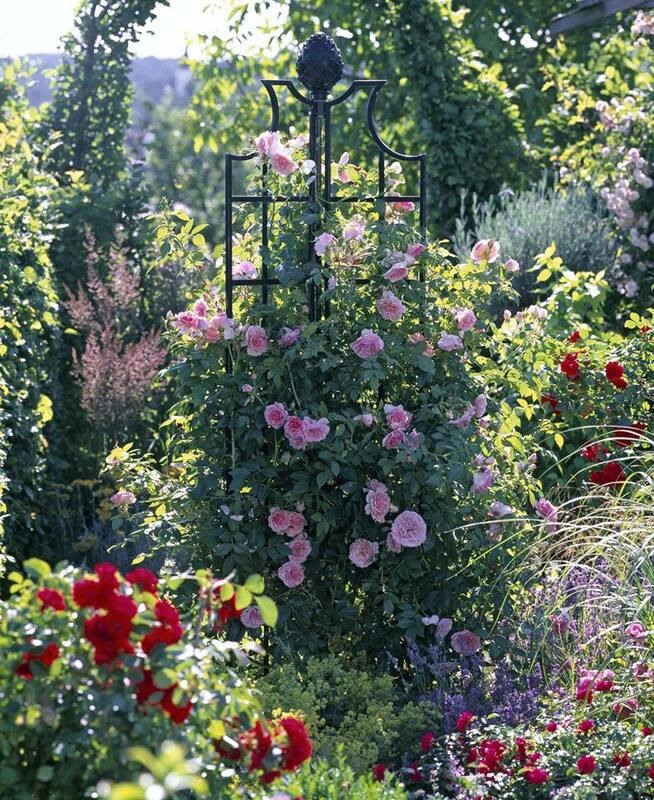 Roses and clematis growing on Classic Garden Elements trellises. Behind a luxuriant hydrangea bush, the red ‘Florentina’ climbing rose (Kordes) scales a Classic Garden Elements ‘Beekman’ trellis. 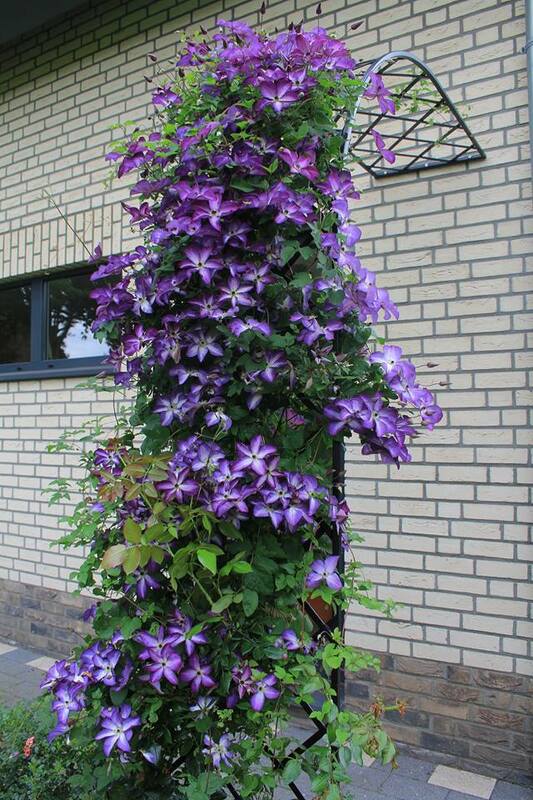 On the façade the narrow metal wall trellis helps ‘Venosa Violacea’ clematis to reach soaring heights. ………a rose is a rose is a rose…….Roses, Roses, Roses! 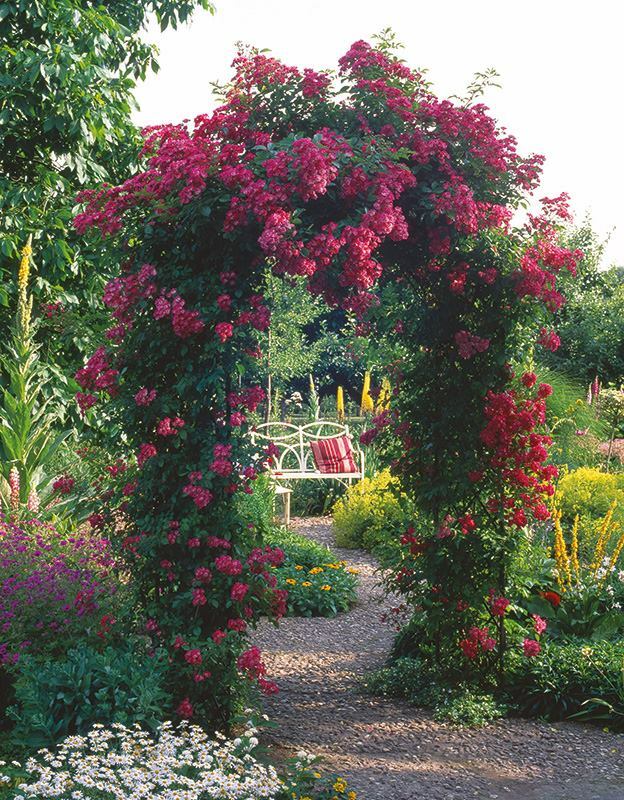 Can there be any more stunning way to display the Queen of flowers than on a trellis arch? Densely woven blooms and foliage take centre stage, while their seductive fragrance erupts into the surrounding air. 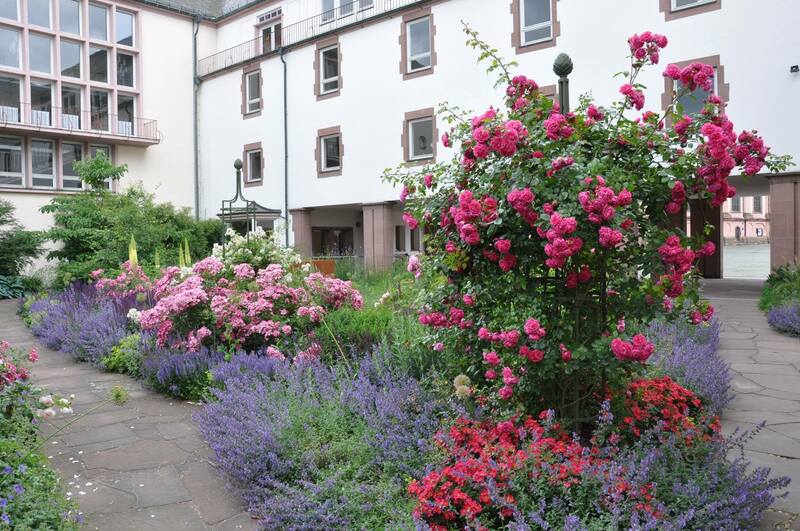 We are indebted to Roland Marquart from the Rosarium in Baden-Baden for this image. Rambler roses ‘Ghislaine de Féligonde’ und ‘Perennial Blue’ seen growing together on a large Classic Garden Elements ‘Garden Obelisk I’. 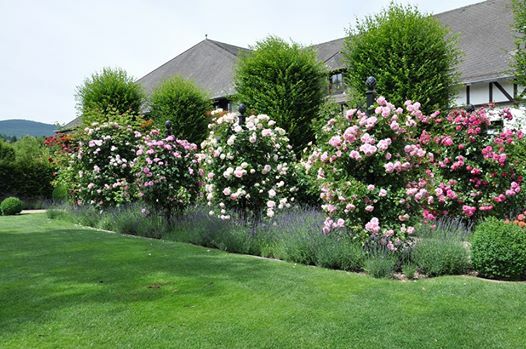 Small rambler roses such as ‘Ghislaine de Féligonde‘ und ‘Perennial Blue‘, depicted here, are ideal for taller rose obelisks and rose pillars. Here they are seen growing together on the park version of the Classic Garden Elements ‘Garden Obelisk I‘. The Gallica rose ‘Tuscany Superb’ in luxuriant bloom on a Classic Garden Elements “Giverny” Rose Umbrella. The Gallica rose ‘Tuscany Superb’ in luxuriant bloom on a Classic Garden Elements “Giverny” Rose Umbrella. 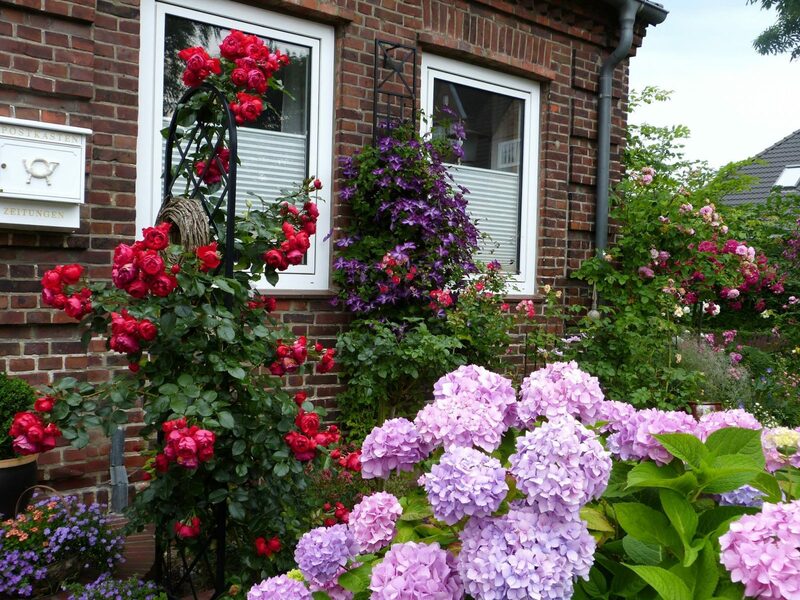 This picture was taken in a cottage garden in Bavaria. The fragrant blooms are composed of three layers of deep velvety crimson petals which encircle the delightful golden stamen tufts. A highly seductive play of gold and crimson. 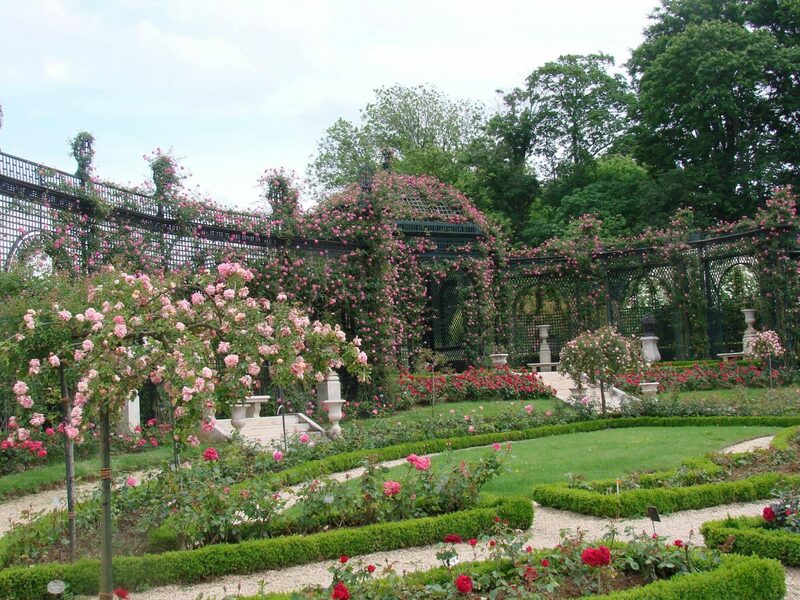 Garden arbour with roses in one of the world’s most beautiful rosariums: the Roseraie du Val de Marne’ in L’Haÿ-les-Roses south of Paris. An absolute must for every rose lover. 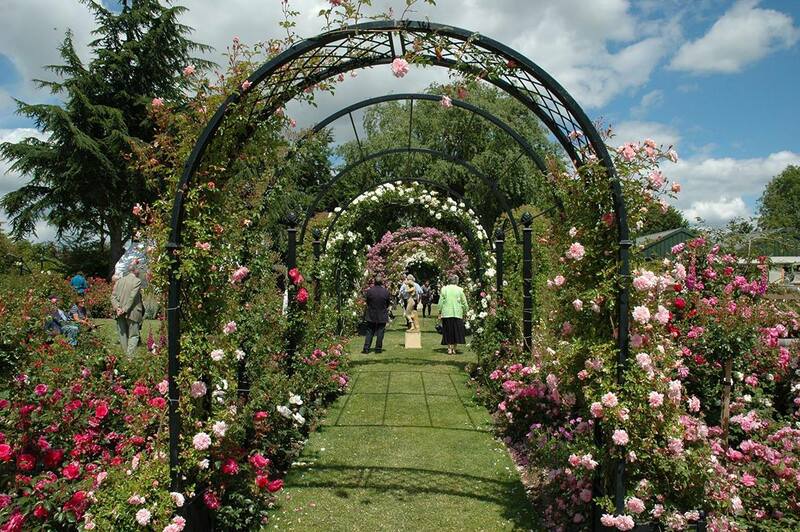 Every year in June, the rose arches in L’Haÿ-les-Roses south of Paris are awash with blooms. Lined up in a row, the arches direct our gaze towards the stone vase at the end of the long pathway. We are grateful to Les Amis de la Roseraie du Val-de-Marne à l’Haÿ-les-roses for providing this image. In Japan blüht die weiße Kletterrose ‘Marie Curie IYC2011’ überreich auf dem Rosenbogen aus Metall von Classic Garden Elements im Rosarium von Yokohama. 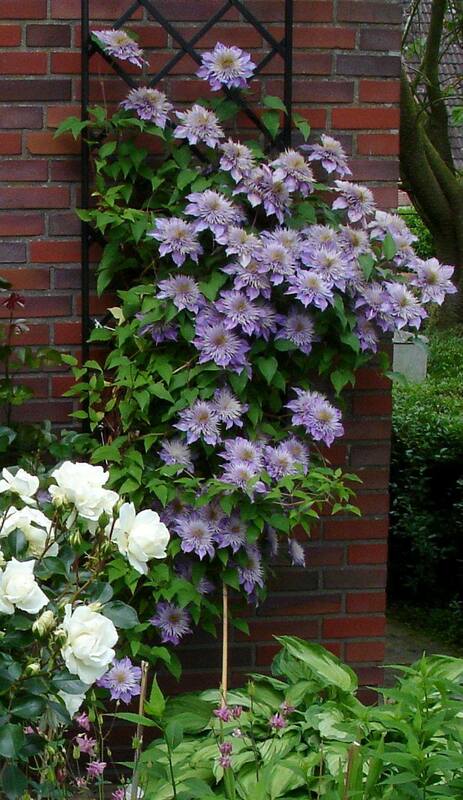 ‘Crystal Fountain’ clematis on the distinctive Classic Garden Elements ‘De Rigeur’ wall trellis. 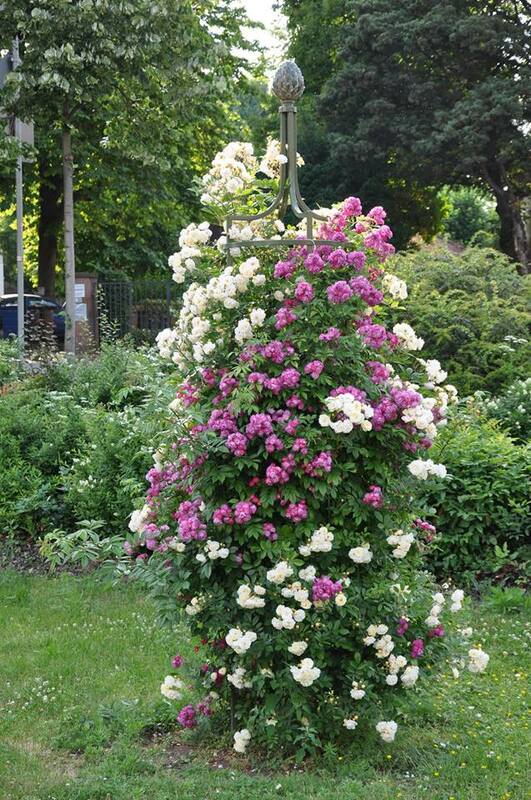 The ‘Sweet Laguna’ climbing rose on a Classic Garden Elements rose obelisk. 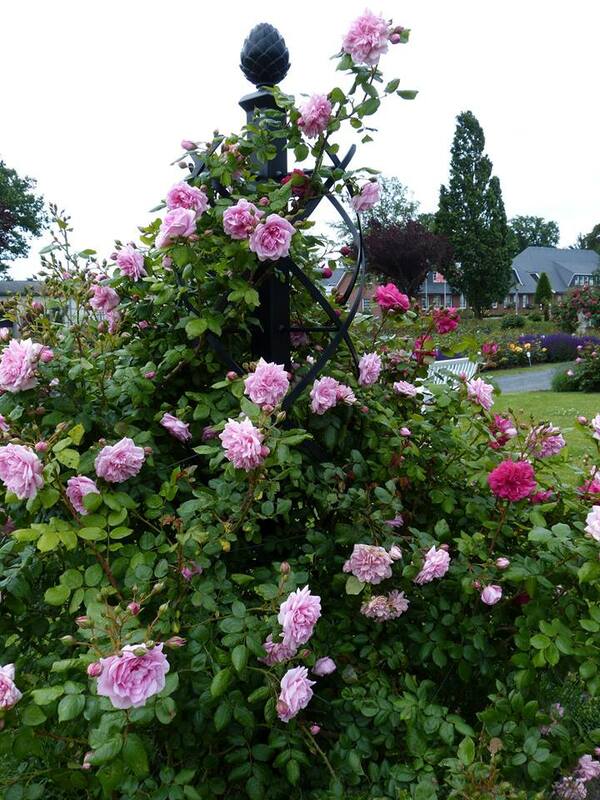 At the Kordes show garden in Sparrieshoop, the long canes of the ‘Sweet Laguna’ climbing rose are trained spirally on a Classic Garden Elements ‘Charleston’ rose pillar obelisk. 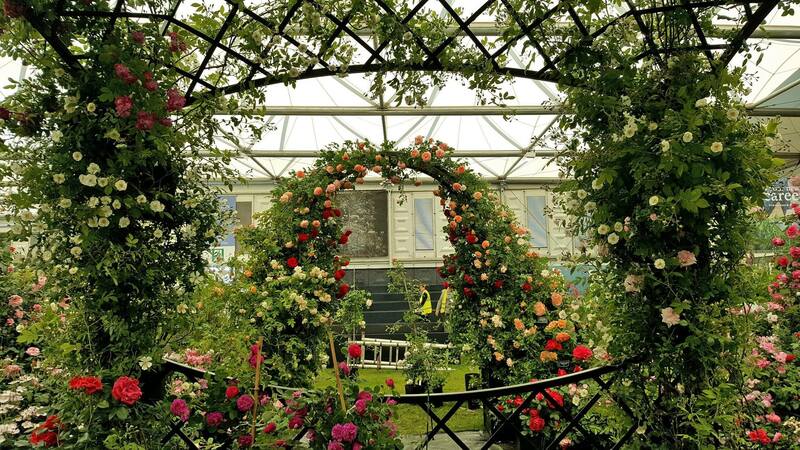 A few leisurely hours in the fresh air, framed by the Victorian Rose Arch with the shimmering scarlet ‘Santana’ climbing rose. 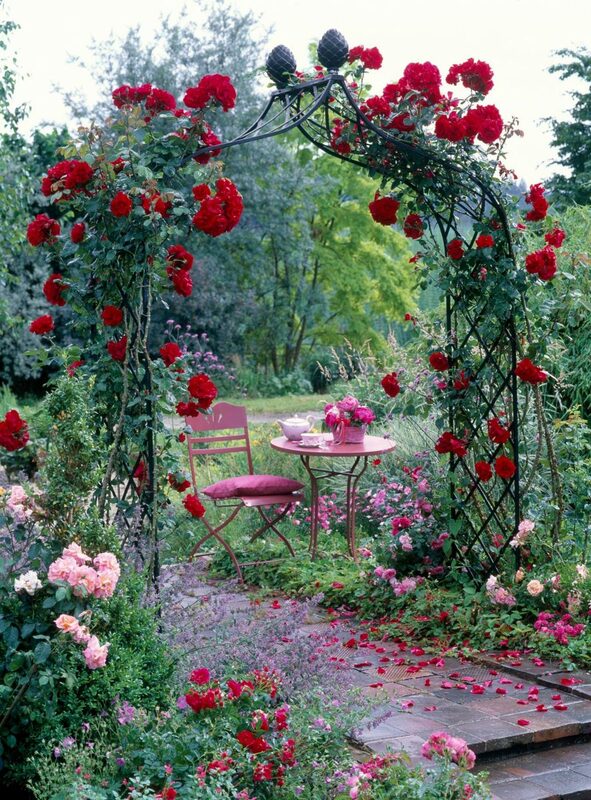 This garden rose arch defines the sitting area, creating a sense of intimacy in an inviting setting. 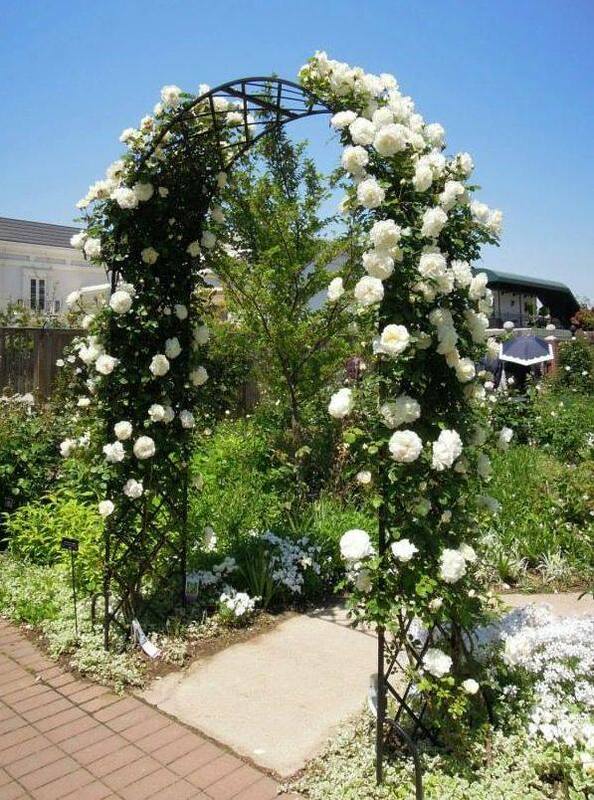 The ‘Santana’ climbing rose with a Classic Garden Elements ‘Kiftsgate’ Victorian Rose Arch in a photo by Friedrich Strauss. 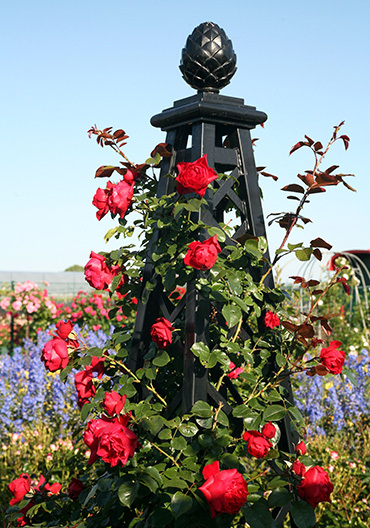 The Classic Garden Elements ‘Obelisk II’ has become the definitive metal support frame for roses. In this picture by Friedrich Strauss the obelisk supports a ‘Kir Royal’ rose. 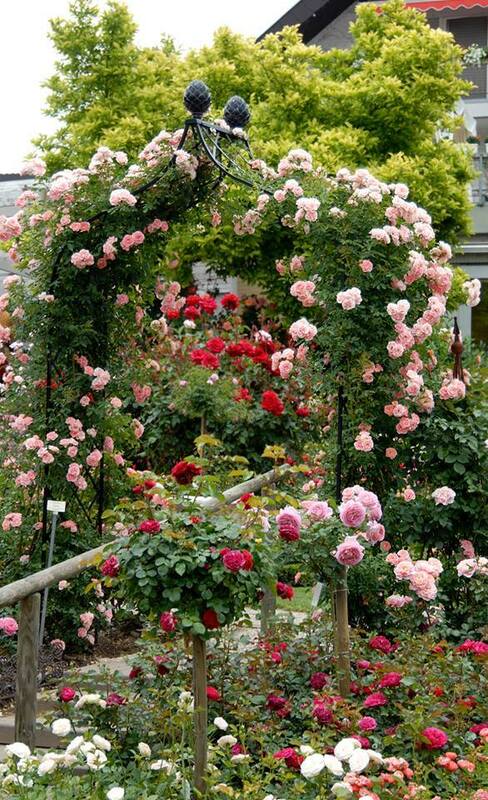 The ‘Maria Lisa’ climbing rose envelops a Classic Garden Elements Roman Arch in a sea of blooms. 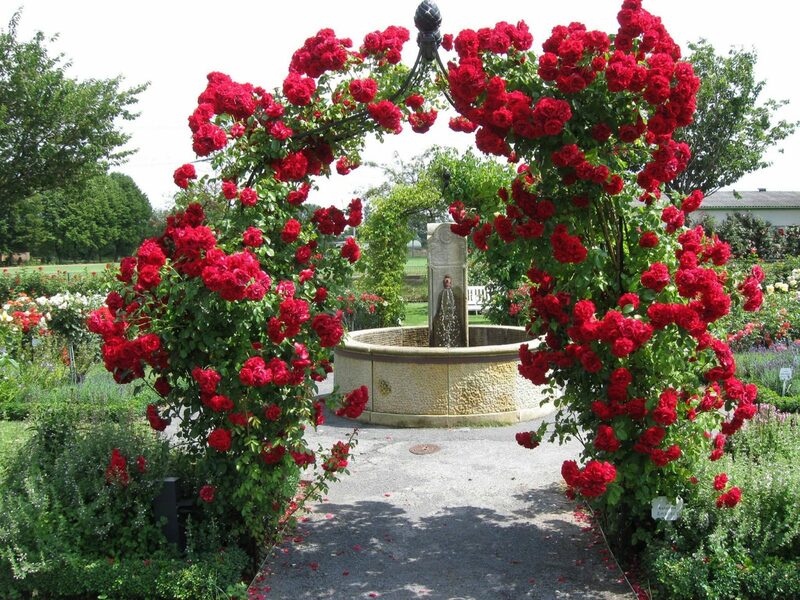 The Classic Garden Elements ‘Bagatelle’ Roman Rose Arch with ‘Maria Lisa’ roses. In July, at the height of its blossoming, it become a perfect pasture for bees. 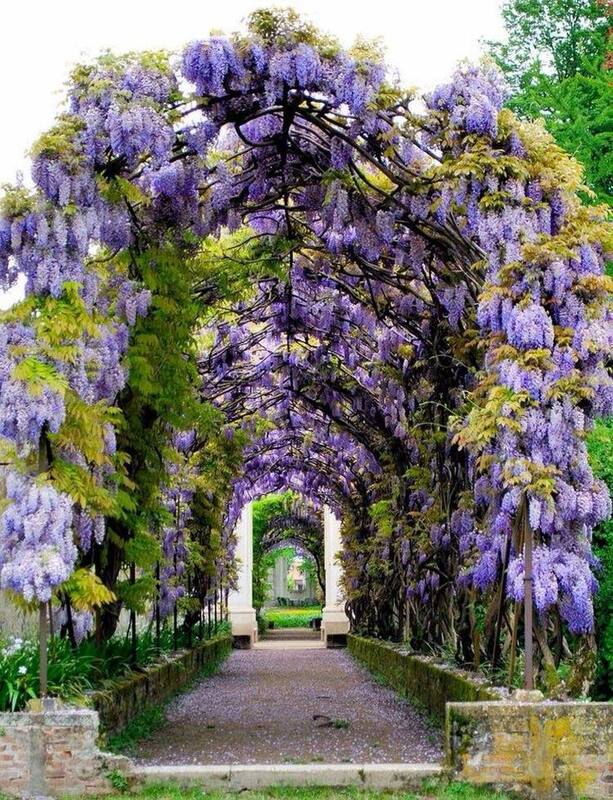 A sturdy metal rose arch bathing in a sea of ‘Etoile Violette’ clematis blooms. 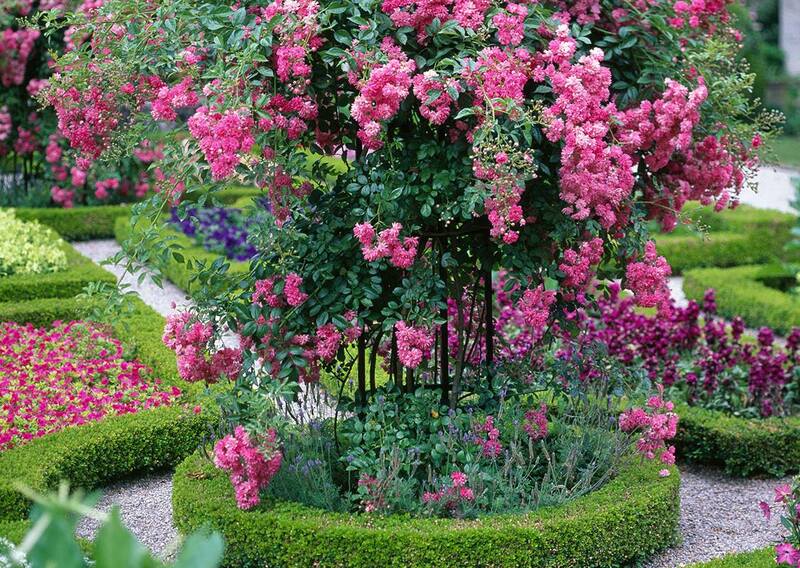 A ‘Raubritter’ climbing rose with a profusion of pink blossoms in the stately Spa Gardens of Baden Baden. In the Blue Garden at the Arboretum Ellerhoop, the eye-catcher is a Classic Garden Elements ‘Wallingford’ Gazebo. 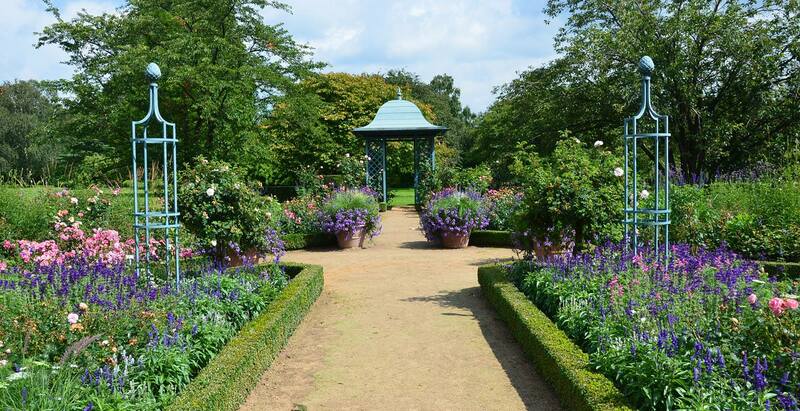 The Blue Garden in the Arboretum Ellerhoop with a ‘Wallingford’ metal gazebo and two round garden obelisks, both by Classic Garden Elements, in a photo by Brigitte Bergschneider. 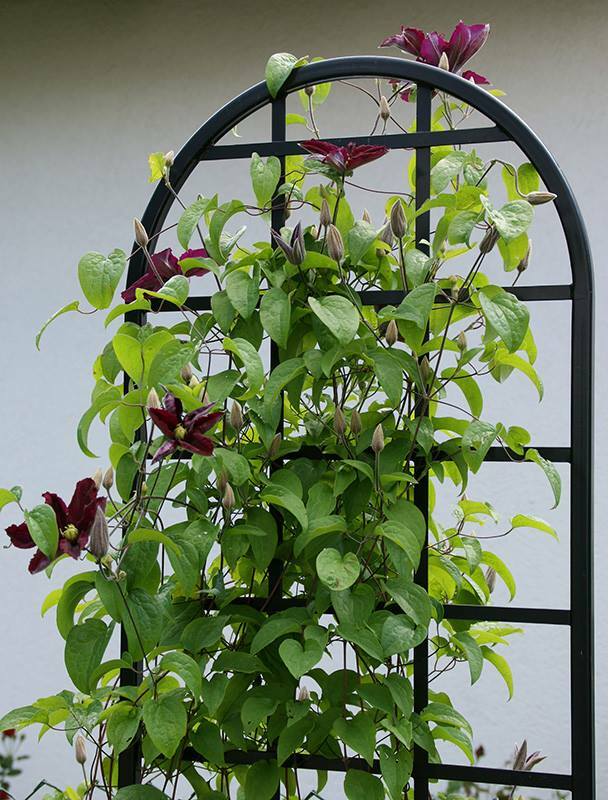 The ‘Giverny’ Umbrella Trellis is an exceptional metal plant support frame. The design is inspired by a frame from Claude Monte’s garden in Giverny, after which it is also named. 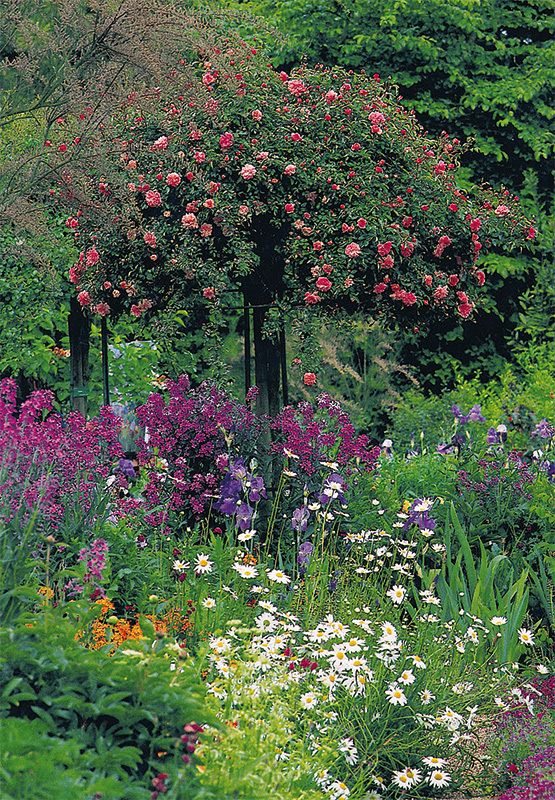 After only three years, the luxuriant ‘Rosarium Uetersen’ standard weeping rose (Kordes) has covered a Classic Garden Elements ‘Giverny’ umbrella trellis. 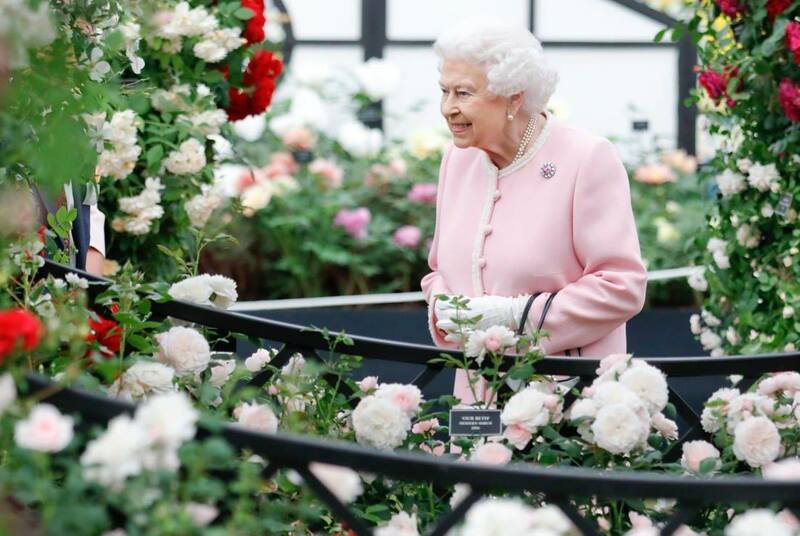 As well as stabilising the rose trunk, the sturdy metal frame also allows you to train the generally upward-growing canes downwards, thus promoting numerous budded side shoots. Classic Garden Elements’ ‘St Albans’ Garden Arbour is the perfect rendezvous for an intimate tête-à-tête. Fragrance and colour for people in love. 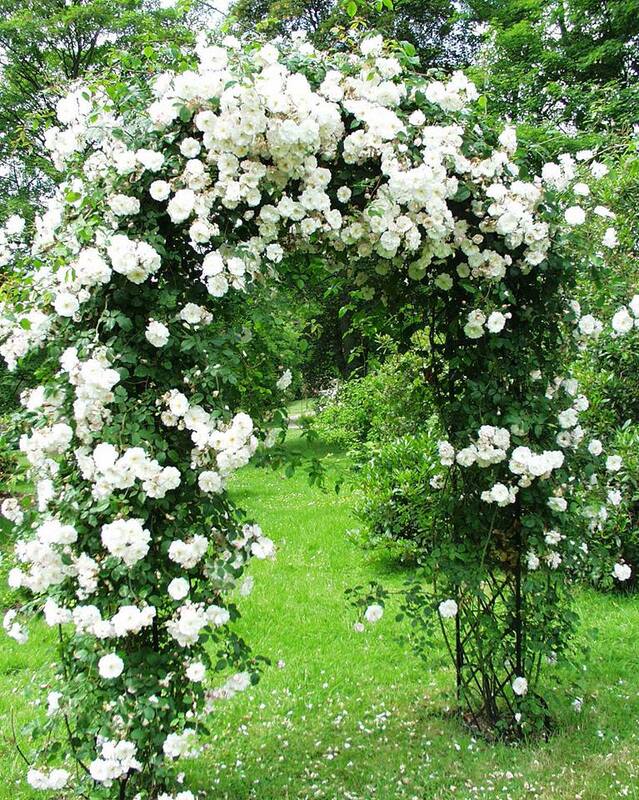 The weak-growing ‘Rosilia’ Rambler Rose scales a Classic Garden Elements ‘Kiftsgate’ Victorian Rose Arch. 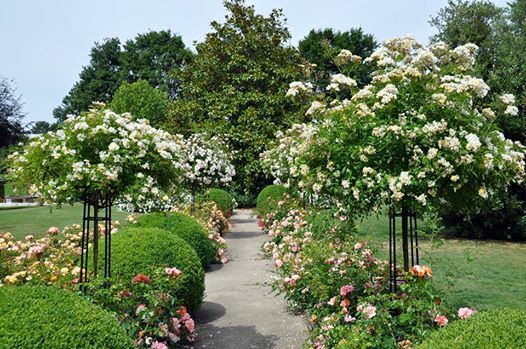 At the Rose Garden at l’Haÿ-les-Roses, near Paris, the art of cutting, training and tying the metre-long canes of numerous ‘Alexandre Girault’ rambler roses (Barbier,1908) has a long tradition. We are grateful to the Friends of the Rosarium (Les Amis de la Roseraie du Val-de-Marne à l’Haÿ-les-roses) for supplying the photograph. 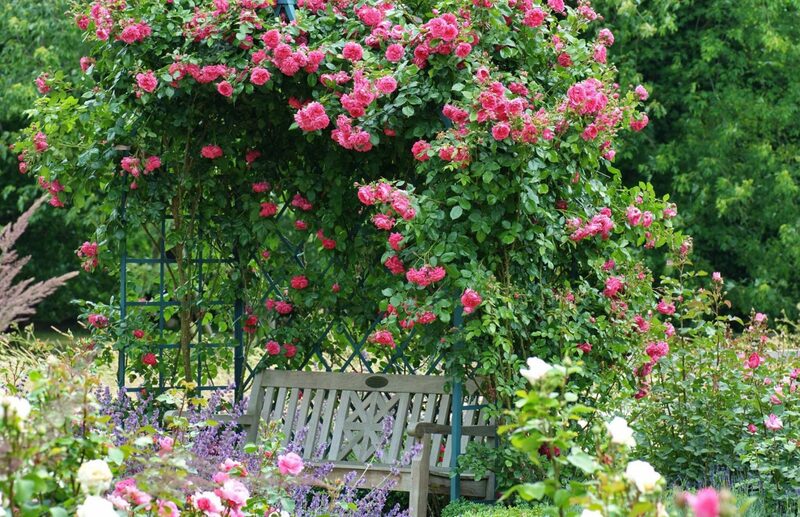 A lovers’ teak bench in a large Classic Garden Elements Victorian Rose Arbour which is covered with ‘Laguna’ climbing roses. The photo was taken at the Arboretum Ellerhoop near Hamburg. Three years after planting, the roses now cover the greater part of this sturdy metal frame. 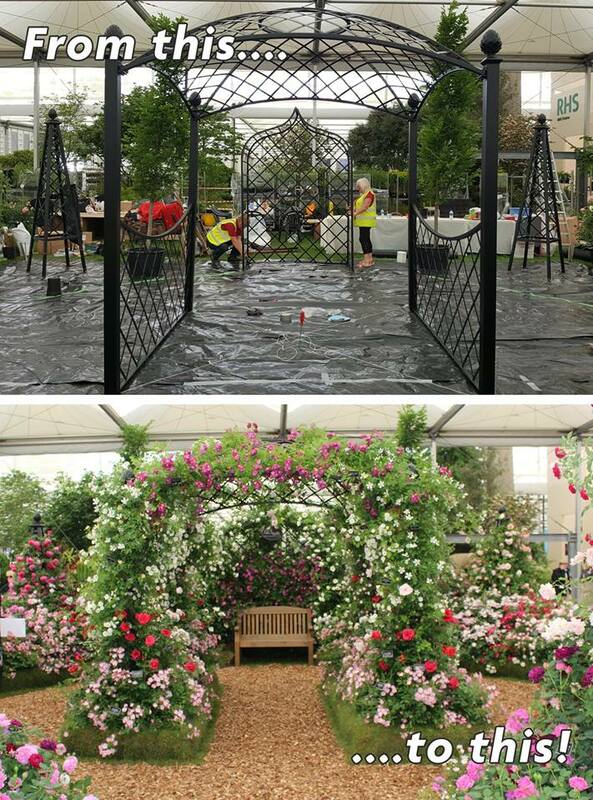 Two Classic Garden Elements made-to-measure ‘Beekman’ Free-Standing Trellises completely covered by climbing roses by Meiland: the stunning ‘Palais Royal’ (left) and ‘Pierre de Ronsard’ or ‘Eden Rose’ (right). 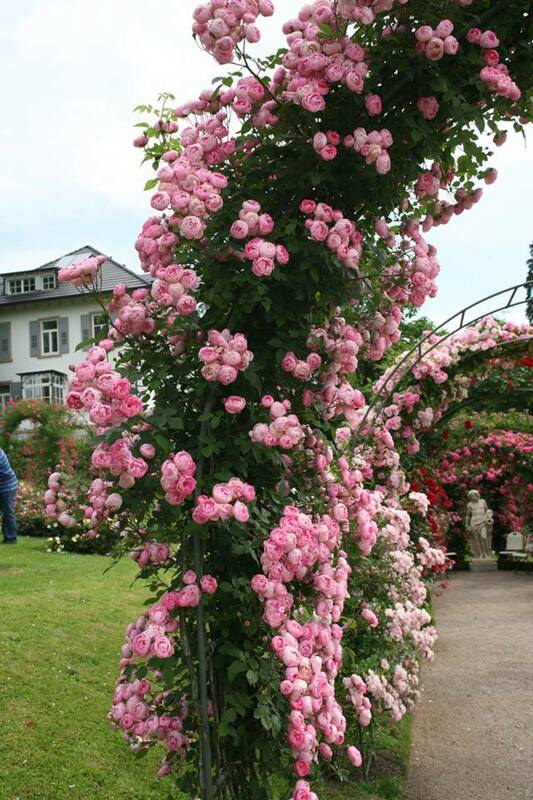 Both varieties thrive at lofty heights in the garden of rose book author Kasimir Magyar at Rüschlikon on Lake Zurich. Simply splendid. Chelsea 2018. Peter Beales Roses. The Stand. 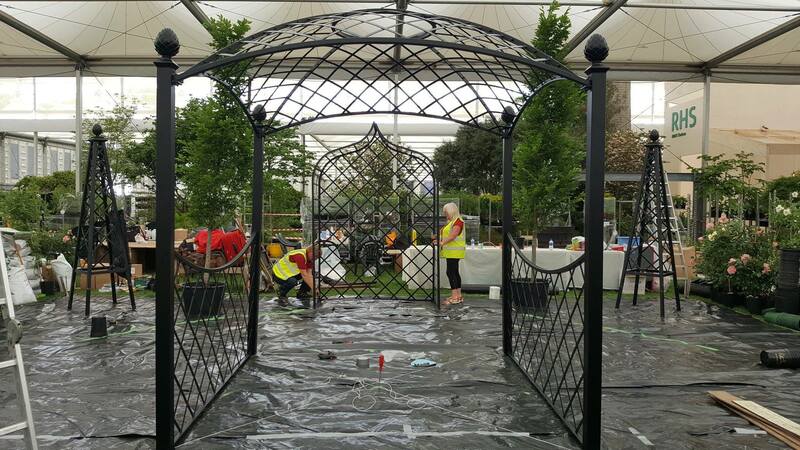 Classic Garden Elements Thank you so much for the lovely centre piece, obelisks, arbour and arches that feature on our exhibit at this years Chelsea Flower Show! 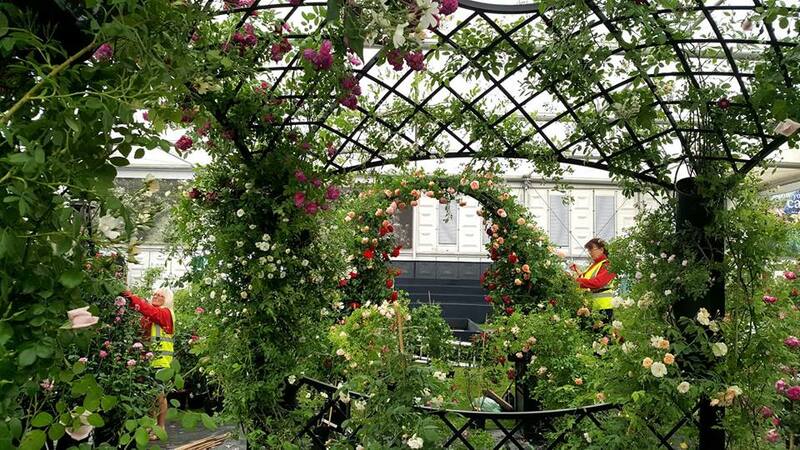 Exceptional quality as always and the roses and structures together make the perfect combination! Grosse Ehre für Peter Beales Roses Ltd aus Attleborough im 50. Jubiläumsjahr der Rosen-Gärtnerei. Königin Elisabeth II. 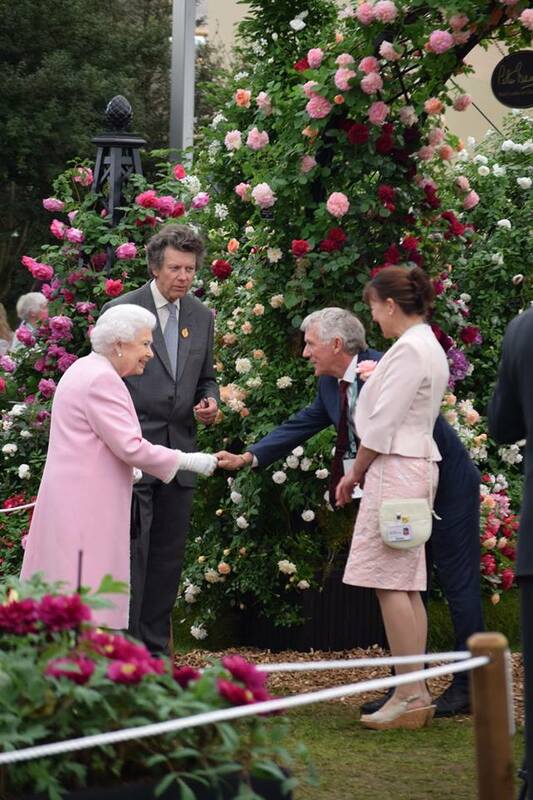 besuchte gestern der Stand unseres englischen Partners auf der Chelsea Flower Show. Less than two years after planting it is already a passionate climber. 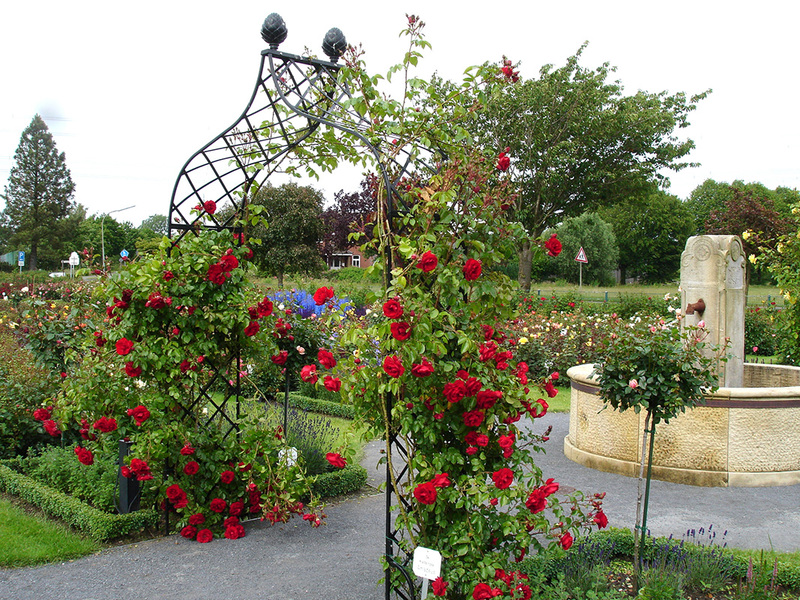 At the Kordes rose show garden in Sparrieshoop, the red ‘Amadeus’ climbing rose has scaled one of Classic Garden Elements ‘Kiftsgate’ garden rose arches. 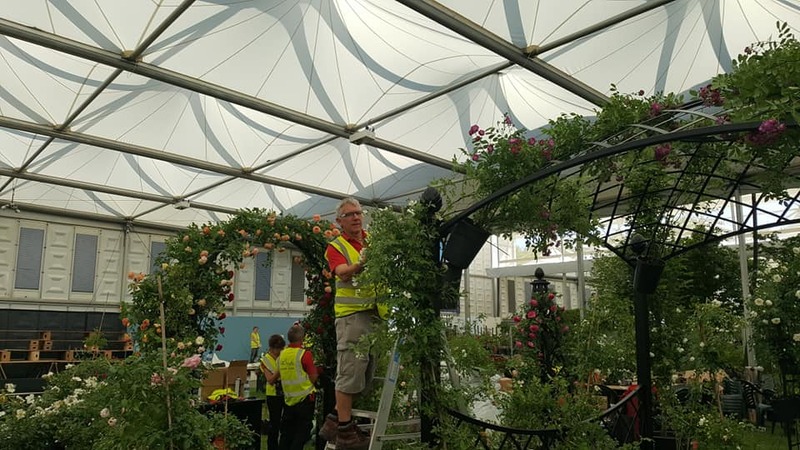 THE CHELSEA FLOWER SHOW 2018 THE BUILT UP OF THE STAND OF OUR UK PARTNER BEALES ROSES With our new Pavilion made exclusively for Chelsea 2018 Day 5 – May 19th, 2018 Day5 of build-up week at Chelsea and the stand is really starting to come together now! 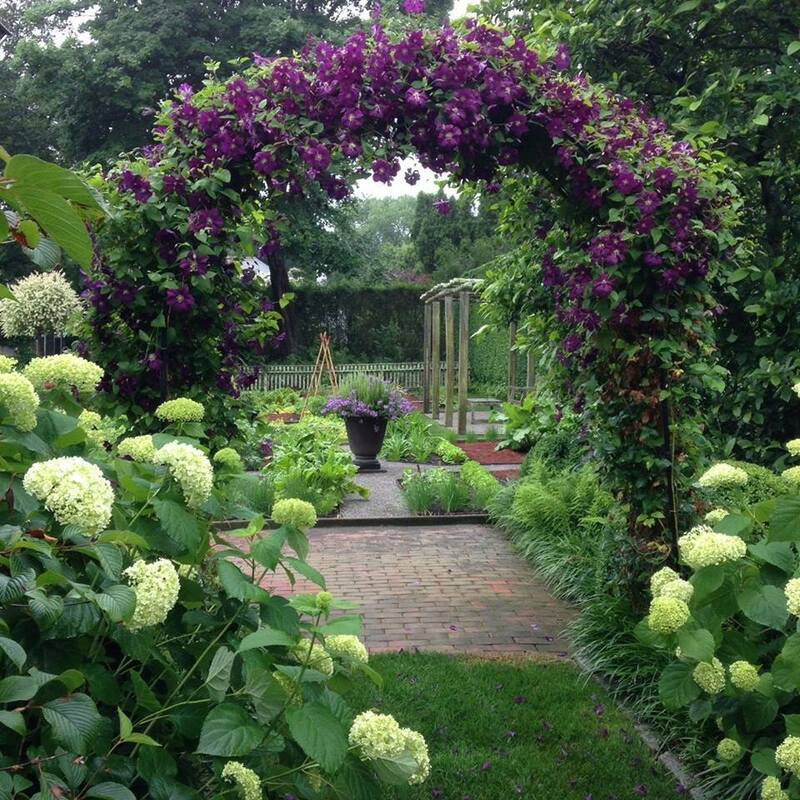 ‘Warszawska Nike’ clematis wraps itself around a Classic Garden Elements ‘Burlington’ Garden trellis. The stable anchor ensures that this robust 2-metre-high steel plant support stands free in the garden without needing to be set in concrete. 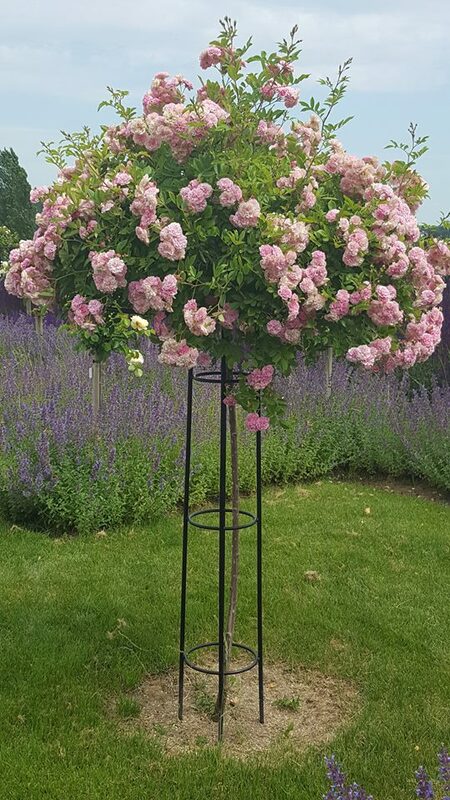 Classic Garden Elements’ Malmaison Pyramid Trellis with the magnificent Kordes Climbing Rose Florentina two years after it was planted at the breeder’s show garden in Sparrieshoop. In Claude Monet’s Garden at Giverny, the long shoots of the grafted ‘Paul Noel’ hybrid wichurana (Tanne, 1910) hang romantically over an umbrella-like frame of iron. Beneath the frame, shimmering purple-petalled common honesty (Lunaria annua), blue irises and contrasting white Shasta daisies (Leucanthemum) complete the picture.